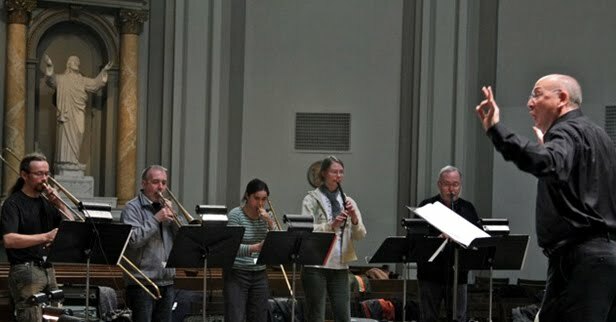 I had a chance yesterday morning to speak with Stephen Stubbs, who is playing, in the orchestra for Orphée et Eurydice, two instruments you don’t always hear in an opera house. The Artistic Director of Pacific Musicworks, Stephen also wrote the interview with William Burden featured in our in-house program. 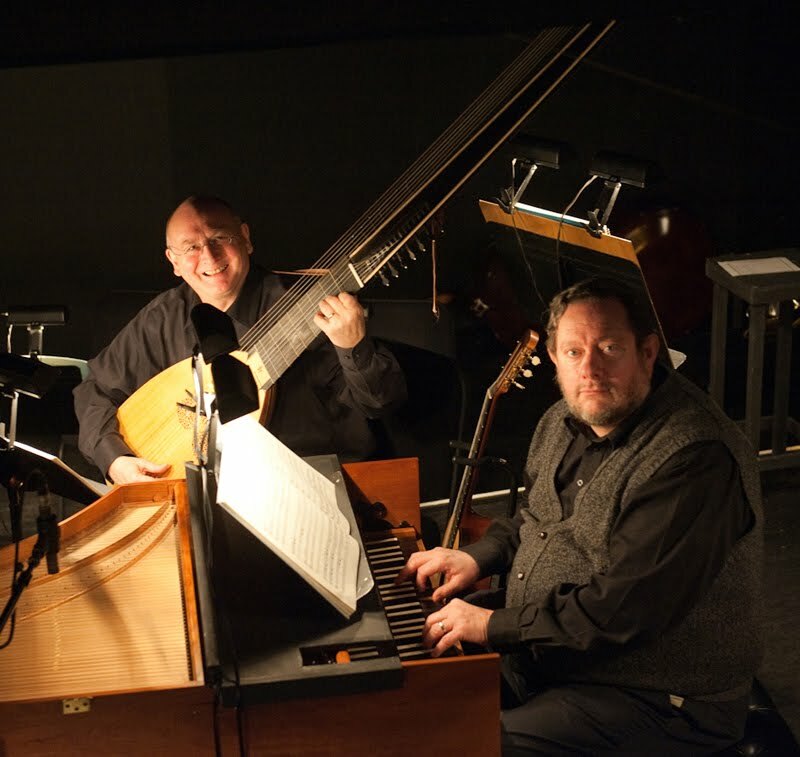 Pictured below, Stubbs with the theorbo and Phil Kelsey at the harpsichord, in the pit at Orphée et Eurydice (Elise Bakketun, photo). I found out a bit more about why the tenor role in this opera is so high, how the choice of instruments follows Gluck’s harmonic color palette, and what’s going on next at Pacific Musicworks. Stephen, what can you tell us about your history with this opera? I first became familiar with Gluck’s Orpheus because I was invited to conduct the Italian version in Bilbao, Spain, about 10 years ago. I’d spent my career in Baroque music, so it was a jump into a wild new age of classical to do Gluck. The opera house in Bilbao is a little jewel box, about 800 seats, and we did that earlier, Italian version with a Slovakian orchestra, a Spanish cast, and me, an American conductor! What a fantastic experience—the singers understood the style, the orchestra, from Bratislava, I had worked with them before, they had specialists in period horns, the whole thing. My wife played the big harp solo on a Baroque harp. 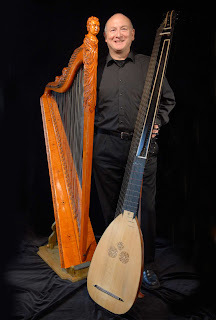 We don’t actually know what kind of harp was used at the first performances; the modern, pedal harp was just coming into use at that time, so we did it with Baroque harp. My first initiation to the piece was happy on many counts; it was a beautiful-looking production by Emilio Sagi. I did notice that conducting all the recitative in the third act was one of the biggest challenges of my life. It can be difficult to get the orchestra to act as one person, one piano accompanist, when you have the flexible rhythm of recitative. Italian delivery encourages people to be more free, and I’ve noticed, working on our current production, that declamation in French tends to be more precise. This is my first experience with the French version of the opera, and I do feel that it’s the real thing—that Gluck must have had the form of French tragédie lyrique, the form of Lully and Rameau, in his mind even when he wrote the Italian version. And that the opera really came into itself, for the first time, in this French version. Now, lots of people at our performances have been asking about pitch, A=440 and all that. There’s a book by a friend of mine, he’s passed away recently, The Story of A by Bruce Haynes, that tells the comprehensive history of pitch. Generally, we can say that in France around 1700, the pitch at the Opéra was about a whole tone lower than modern pitch; they used A=392. We know that for a fact because we have wind instruments form that period, and they fix the pitch. With stringed instruments you can tune them this way and that, but not winds. Such a low pitch makes sense of why the actual notes, the tessituras in so much of this music, look sky-high: they aren’t, it was that those notes were actually a whole tone lower than what they are today. By the time you get to the 1770s, when Orphée was written, things had been moving up all century; but you don’t get A=440, modern pitch, until the mid-19th century, and even that wasn’t made official until the mid-20th. We think in the classical period A was generally around 430, which took the edge off but wasn’t so huge a difference. All the way along, in France, there was this special voice-type: the ‘haute-contre,’ a very high tenor, the French cultivated that kind of sound and that’s what prompted Gluck to write this role for that particular voice. It was sung by a castrato originally, and then Gluck switched the range to tenor when he reworked the opera for France. Yes, the French never accepted castrati, they found it ridiculous. When the Barberini popes fled Rome in the 17th century—they’d spent too much of the country’s money on opera, and other vices—they went to Paris and introduced opera there. The French were thrilled by the idea of opera, but they couldn’t accept the idea of the castrato; it was anathema to them. So they established a different type of leading man, this ‘haute-contre,’ and in Lully and Rameau, you get these high-voiced tenors. 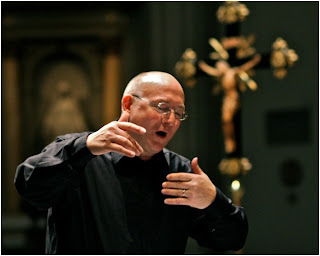 They weren’t trying to imitate the castrato sound; but high voices have this ability to project out over an orchestra and command the attention of an audience, whether you’re talking about tenors or sopranos. Tell us a little about your history with Seattle Opera. I grew up in Seattle, went to the University of Washington, but the first opera I did here was Giulio Cesare, that first year when I moved back to Seattle after living in Germany for about 30 years. It was my luck at that time to play for Gary Wedow, who conducted that production, and we’ve since become good friends. He asked me to play in this Orphée, and I love to make music with him. Yes, I was trying out a guitar from around 1800—it sounded beautiful, but I decided to use a modern guitar because it has more power. When the music is up-tempo and charming, like the scenes with Amour, I’m playing classical guitar. But when it’s darker and more serious, I’m playing the chitarrone or theorbo (you can use either name), an instrument that was typically used to accompany recitative in the 17th and 18th centuries. It has a compact, lower sound, a mid-range instrument. Who knows what Gluck had in the pit in 1774? They still had theorbos, and Baroque guitars, and the modern classical guitar was just coming in. Are either of those instruments amplified? You know, we tried amplifying both instruments but Gary decided it sounded perfectly fine without it, so no, they aren’t amplified. You mention these instruments being used, originally, to accompany recit. But in Orphée and Eurydice the recits fade into concerted numbers without stark boundaries. Do you stop playing when we get the ‘official’ arias in the score? I play in about 2/3rds of this opera. In the Dance of the Furies, and the big ‘Intro to Hell’ scene with all the trombones, the orchestra is very loud and I’m not going to make any impact whether I play or not, so I rest at those points. But in the Elysian Fields scene I play throughout. I’m just hoping to add some charm to the overall sound there. Generally, I’m using the chitarrone to accompany the more serious dialogue scenes, which is what people did at the time: they estimated the better instrument for the color of the scene, what would best fit the key signature. The chitarrone is better for scenes with flat key signatures, the classical guitar for sharp keys. That’s fascinating, he really does assign key areas based on the mood of the scene—those darker scenes in flat keys, accompanied by chitarrone, the lighter scenes (the ones with Amour) in sharp keys. And sometimes the must pungent, unpredictable harmonies! Yes, Gluck goes outside his normal harmonic range in piquant ways, sometimes it’s even brutal—like the sudden interjection of the horns, in an obliquely related key, underscoring the Furies’ cry of “No!” when Orphée is appealing to them. It’s almost like polytonality—he’s in one key and they’re in another. It’s not sophisticated, but it confronts the ear with something unmissable. Even 240 years later it’s easy for us to hear; his harmonies still have the power to shock. Tell us a little about what’s next for Pacific Operaworks. Yes, we have an exciting project coming up at the end of March: Il trionfo del tempo, The Triumph of Time, an oratorio Handel wrote when he first went to Rome, when he was 22, just bristling with his youthful genius. Unlike his most famous oratorios, like Messiah, there’s no choir—just four virtuosic roles who take on allegorical figures: Beauty, Pleasure, Time, and Truth. So it becomes very operatic: it’s a battle for the human soul between these four characters. (Time and Truth win out over Beauty and Pleasure, in the end!) Handel came to Rome and was able to write for the best singers in the world, and our ambition has been to assemble the best possible cast as well. We’ve got Amanda Forsythe from Boston, she just made her Covent Garden debut, a first-rate soprano who’s starred in several shows with the Boston Early Music Festival. Our second soprano is Dominique Labelle, known all over the world for Handel. She sang Donna Anna on the famous Peter Sellars Don Giovanni set in Harlem. Our countertenor is Lawrence Zazzo, an American who’s had a big success in Europe. He’s sung at the Met, but this may be his West Coast debut. And Ross Hauck, our tenor, is the only one who’s actually living here; he’s starred in many of the things we’ve done. We’ve assembled a fantastic Baroque orchestra, with string and wind players coming from all over the place. The program will be March 30 and 31 at 8pm at Daniel’s Recital Hall, right there at 5th and Marion, formerly the Methodist Church. It’s a wonderful place to hear music, it has a large capacity, but everybody feels close to the performers. For more information, visit us at Pacific MusicWorks.org!